Symone Abbott readies for a point. The senior outside hitter and the Wildcats split two weekend games against Michigan and Michigan State. Northwestern left the state of Michigan with mixed emotions. The Wildcats (14-14, 4-12 Big Ten) kicked off their road trip on a high note with a five-set win over Michigan (17-11, 7-9) on Friday night, but failed to keep the ball rolling Saturday against No. 8 Michigan State (19-6, 12-4). Early in Friday’s contest, NU’s fate looked bleak. The Wolverines came out with a bang, rattling off a five-point run to open the match, and later had a seven-point run in the first frame. Michigan won the set 25-13 and held all the momentum. Coach Shane Davis said the break between the first and second sets changed the game and allowed the team to regroup. A switch flipped and the Cats emerged hot in the second set, claiming a 6-point lead only eight points in. After finishing the second frame up 25-22, NU continued its run through the third set, ultimately winning 25-19. But the Wolverines took control of fourth set, taking it 25-21. Freshman middle hitter Alana Walker said walking into the final frame, the team was as confident as ever. In the end, the Cats finished on top, taking the set 15-13. The following night, though, NU failed to retain its momentum, falling in straight sets to the Spartans. Walker said as the game progressed, she saw the Cats’ bad habits return. 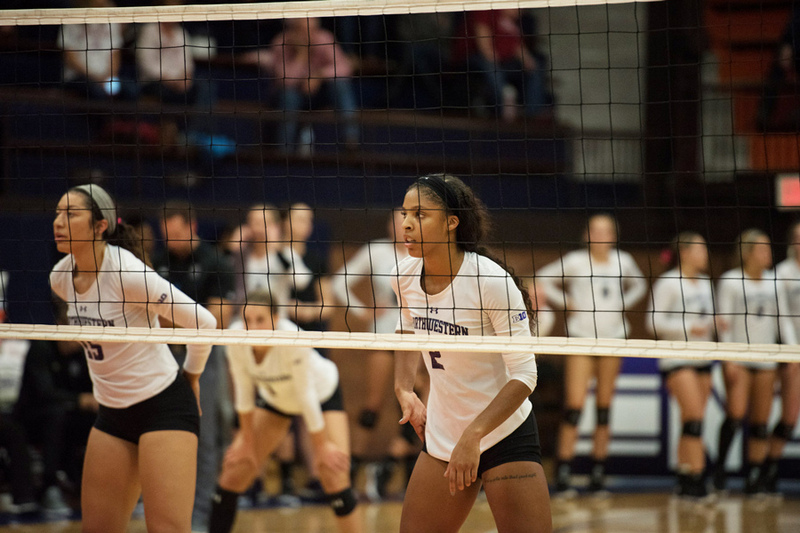 Against Michigan State, NU peaked in the second set, which it lost 26-24. Senior middle blocker Gabrielle Hazen said the third set — with a final score of 25-9 — didn’t show the team’s fight. In the frame, Spartans outside hitter Holly Toliver rattled off 11 points on her serve. Despite the loss to Michigan State, Hazen said the Cats are pleased with their weekend performance and urged fans not to lose hope in NU.